The imperial city of Marrakech with its atmospheric souks and UNESCO-listed medina, is the ideal destination for a city break. 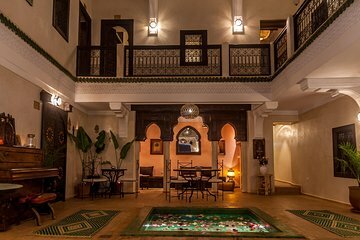 This 4-night package takes all the hassle out of organizing your trip, with airport transfers, luxury accommodation at Riad Haraka, and a delicious dinner of traditional Moroccan cuisine. Also included is a private full-day tour to the Three Valleys—Ourika Valley, Asni Valley, and Takerkoust lake—in the Atlas Mountains.